Weekend America: Foraging for Lunch on the Streets of L.A.
Everyone knows we're facing tough economic times -- job losses are increasing, yet prices are rising for commodities, including oil and food. Well, the food part of it is not bothering Nance Klehm as much as it is the rest of us, because she gets a great deal of her food for free by foraging. And I don't mean in the woods. Nance Klehm: You guys look like radio people! You're all connected by a cord. Bill Radke... We picked a busy street to forage on. Klehm: Yeah, well, we're mostly surrounded by busy streets in L.A., so why not start here. We're already here. There's already something to eat. And you're looking down right next to the sidewalk. Yeah, there's a couple of plants here that we can taste. To me this is a bushy, overgrown mess. What do you see? Pepper Grass. It tastes like pepper. It has little heart-shaped leaves. It is really distinguishable from other plants, it's a really easy thing to notice in the landscape, and both the flowers and the seeds are edible. Do you want to try some, Bill? I'd love to try some... Now, are we going to rinse this? Um... We're going to take our risks (laughing). Oh, that's very strong. I got a real peppery blast in the flower. We've moved away from the busy street a bit now. There's a couple of things that I do try to do when I'm foraging -- I will try to forage away from cars and away from dog... areas. You look like you kind of wanted to say something like "dog waste" and then you didn't want to say it. How much do you think about toxins, pollution, dogs? I think about it all the time. If I look at our choices in food that are highly processed, I feel like there's more toxins in that processing and in things that are being released into our waterways and into our soils and into our bodies than there are from picking some wild plants that are growing in city soils. So this is more about connecting to the Earth and getting us outside more, and enjoying things in simple ways. I actually think people are shopping so much because they don't know how to forage anymore. It's their hunting-gathering instinct coming into play, and this is a great way to stop shopping. This is all over the place in the hills of Los Angeles -- this is a wild mustard. This is chickweed. You've had nasturtium, I'm sure... Mallow again, wood sorrell, Mexican tea marigold... This is really delightful, it's just wild fennel. The one thing that is really nice about this is that you can actually take time to smell the flowers as you go by them... That's just some really lovely jasmine that we could go over to, but I'm really aiming at this lemon tree. We've got to get one of these lemons. You are so tall and I'm only five feet, five inches. I can reach that, Nancy. They're oranges! Even better. Great! Hi, we're doing a radio story, and can I ask you a question? 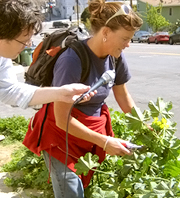 We're talking about the plants all around us, do you ever forage? What do you eat in your yard? Woman in yard: Tomatoes, fruit. Do you ever eat what you see on the street? Woman in yard: Of course not. Klehm: Have you ever had one of these? Woman in yard: Are you sure? Klehm: Yeah! I'm sure. I eat them all the time... You just ate wood sorrell. Woman in Yard: It's good! I'm finding out, you'd be surprised by what you could eat that is growing by the side of the road. The dogs! This is what everyone brings up, Nance. Woman in Yard: That's a problem. Yeah, your dog does have access to all of your plants, m'am. Woman in Yard: But it's my dog! We'll keep moving. (laughter) Is that Wood Sorrell growing over next to us right now? Are you going to take some home with you? So, I figured we could start making a salad. I can smell that fennel when you cut it. Yeah, and then we are going to squeeze this orange on top... Okay, from the streets of L.A.! Mmmm. I'm telling you, that is so flavorful. Yeah, I'm going to take a little pinch here myself. Do you want to share some with me? Oh, I love wild foods and foraging! I've been doing it since I was 16 (Stalking the Wild Asparagus was my first book). This summer I've been eating the "weeds" in my garden for much of my leafy greens. So, it was a great story, a woman who does exactly what I do--eats where she is. Here's a website with info on wild food. And look for Peter Gail's blog. I teach classes in my area also. Happy "weed"ing! Links, please, for edible plants; preferably by national region? Lovely show. I heard that Nance K was on the show and tuned in. Fun and interesting story. I didn't realize so much of what we see growing "naturely" around us is eatable. I enjoyed the report with its message of being connected to our food. I have to admit that I cannot picture myself literally picking up dinner on the way home, but the concept is fascinating. The interview had me truly longing for warmer weather-- fresh, home-grown vegetables and the farmers' markets; spring can't get here soon enough! Thank you for providing an informative and entertaining show every week. This was a GREAT story. I enjoyed it so much! I am only sad that I can't fly to L.A. next weekend to take Nancy's class. Thanks for such an entertaining delight in the middle of my snow bound Midwestern day. I could almost feel the sunshine and taste those greens! nance is the best!! been foraging with her in chicago. always lots to learn, served with heaps of laughs along the way. listen to her; SHE KNOWS! !